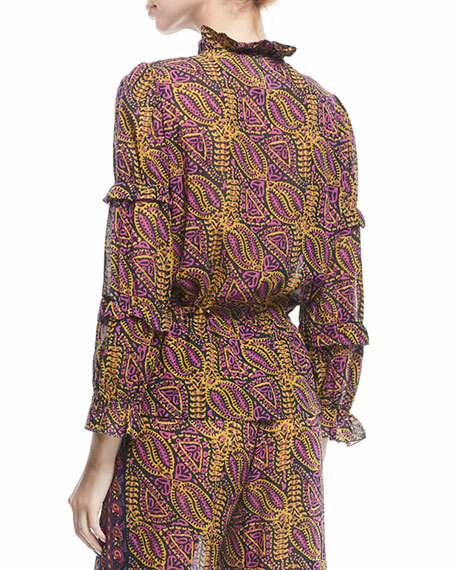 Figue "Zola" blouse with La-La wallpaper-print. Drawstring waist with tassel ties. Born to European parents and having traveled around the world her entire life, Figue creator Stephanie von Watzdorf brings a global, jet-set quality to her collection. von Watzdorf named her line after her favorite fruit - figs - that she ate during her childhood while visiting her grandparents' homes in Italy. Figue melds the urban aesthetic of London and Paris with color-rich inspiration from the Mediterranean and other exotic locales, resulting in bright patterns that dance across tunics, caftans, and blouses. Unique items like beaded bags and military jackets also sprinkle each collection. For in-store inquiries, use sku #2367363.